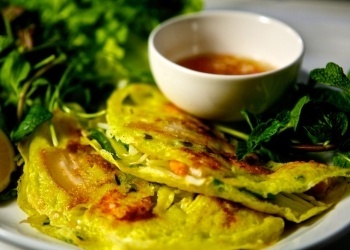 Banh Xeo – Sizzling Saigon style crepes. When I first returned to Charleston in 2011, one of my immediate misgivings was the lack of Vietnamese restaurants. Having lived here in the 90’s, I was used to treks to Ashley Phosphate for Cha Gio (crispy spring rolls wrapped in lettuce cups with fresh herbs), Goi Cuon (fresh spring rolls wrapped in rice paper) and Bun Thit Heo (BBQ pork noodle salad). For a while, I’d headed up to Pho #1 in the H&L market off Rivers & 526. It filled the gap and was, at least in part, pretty much what you wanted. Then, Pho #1 fell off. The Pho Tai (Rice noodle soup with rare beef) became insipid and uninspired. And the lady that used to greet me with a resounding “HIIIIII!!! !” didn’t seem to be around anymore. I figured that’s how it goes. 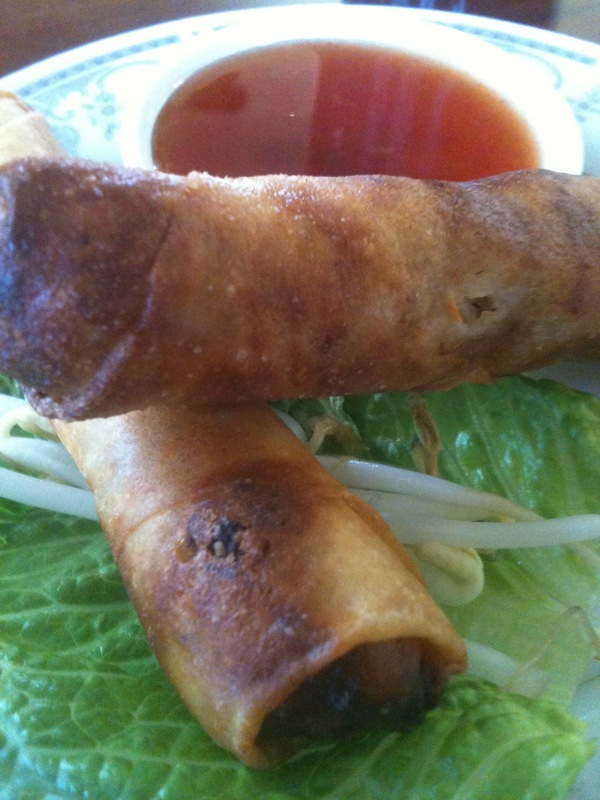 Cha Gio- Spring Rolls with a twist. You wrap them in lettuce and cilantro, then dip away. I ‘d heard last fall that a new place was opening on Rivers. Hoping to God it wasn’t another Toms wearing Skrillex blasting hipster haven, I made the trek to Phuong and was very pleased to be greeted by Miss Phuong herself. After leaving the H&L, Phuong set up her own brick and mortar in the old Raul’s taco shop. The space is clean and well cared for and, kitsch aside, totally cool for a date. I spoke with Phuong and her son Yao to learn their story. Phuong told me they had left Saigon 27 years ago, migrating to Belgium. There, she learned under a French trained Vietnamese chef. She and her family immigrated to the States 7 years ago and made their way here to Charleston. Though she misses Vietnam, she loves Charleston and says her most personal dish is her Com Bo Saigon, a plate of broken rice and beef seasoned with 5 spices. I’ve made several treks since that initial one, and if the devil is in the details, Phuong shines with consistency. You’d like to see more- Banh Mi’s on proper bread, Banh Thom shrimp and sweet potato cakes, bubble teas, Beef 7 Ways options for special occasions, but in the hang time, Phuong is exactly what you want. Phuong’s a little nervous, in a happy kind of way. She’s not sure if Charlestonians will get it or not. If business levels are any litmus, it looks like she’s doing just fine. It was cranking for lunch on Tuesday. Bun Dac Biet – the kitchen sink of rice noodle salads- spring roll, bbq pork, lemongrass chicken, beef and shrimp. It’s a hot mess in the best of ways.